This workshop will explore the visual possibilities of stitching, with emphasis on artistic expression. Participants will work with line, color mixing, and texture effects, and develop personal approaches to imagery, materials, and embroidery methods. The workshop is designed for any level of experience, and as an opportunity for artists and designers to work with intense focus on small compositions. Participants will design and execute badges, pins, or other small-scale formats during the workshop. For at least 20,000 years, people have used needle and thread to improve and enrich their surroundings. Rightly compared to drawing, painting, and relief sculpture, “the language of stitch” also carries its own social and ritual connotations. Participants will develop their own new studio directions; they are asked to bring examples of previous work in any medium (or photos of work) to foster discussion of personal strategies for these new directions. For embroidery: four-to-six squares (approximately 18 x 18”) of solid-colored lightweight cotton, linen, or wool, with a fairly smooth, even texture (three or four should be enough). Choose neutral or dark colors. Assorted cotton embroidery flosses. Include at least one pair of highly contrasting colors and a range of warm and cool colors in different shades. The medium of stitched textiles carries memories of ritual and comfort, and offers perspectives on the subjects of time and vulnerability. Even small pieces of cloth can reveal fragments of life's large and expansive rhythms; details can suggest a bigger picture. Tom Lundberg is a visual artist who lives in Fort Collins, Colorado. He is a professor of art at Colorado State University, where he coordinates graduate and undergraduate programs in fibers; he teaches courses in weaving, surface design, and other fiber methods. Lundberg has lectured and taught workshops in the United States, England, and New Zealand, and teaches in Colorado State University’s Italy study-abroad program. Born in Iowa, Lundberg began his university studies at Iowa State University. Following an apprenticeship with potter Clary Illian, he completed his BFA studies in painting at the University of Iowa, where he also studied textiles with Naomi Schedl. Lundberg received his MFA in textiles from Indiana University, where he worked with Budd Stalnaker and Joan Sterrenburg. As a graduate student, he also worked with Diane and William Itter. 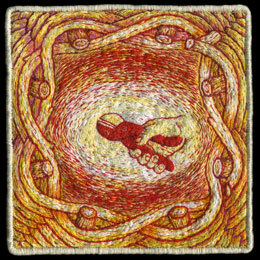 Lundberg’s embroideries are exhibited internationally and are in the collections of the Museum of Art and Design, New York; Renwick Gallery, Smithsonian American Art Museum, Washington, D.C.; Arkansas Arts Center Foundation Collection, Little Rock; Indianapolis Museum of Art; State of New Mexico Art in Public Places; Chase Manhattan Bank, New York; and Kaiser Foundation Health Plan of Colorado, Denver.